The Taj Mahal is one of the world's most recognisable and evocative sights, and despite the incredible hype, a visit here cannot disappoint. Set overlooking the River Yamuna, visible from Agra Fort in the West, the Taj was built by Shah Jahan to enshrine the body of his favourite wife, who died giving birth to her 14th child, in 1631. The story of this great monument to love is given an added poignancy by the fate of Shah Jahan himself. When his devout and austere son Aurangzeb seized power, Shah Jahan was interned in Agra Fort, where he lived out his final years gazing wistfully at the Taj Mahal in the distance. When he died there, in January 1666, with his daughter Jahanara Begum at his side, his body was carried across the river to lie alongside his beloved wife in the peerless mausoleum. 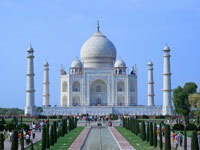 Completed in 1653, the Taj Mahal is set in a large walled garden, between two mini-Taj's (one of which is a mosque), and in front of a long reflecting pond. Close up, the craftsmanship of the building is as spectacular as from a distance - the inside of the vast double-dome is inlaid with delicately-filigreed verses from the Quran and semi-precious stones. Visitors should aim to visit it at dawn and at dusk, as the building truly does change colour through the day, from rosy pink, to gleaming ivory, to twilight-blue. Note that there can often be smog and fog in the mornings. Two days before and after the full moon, the Taj Mahal is open for moonlight viewing, but tickets must be booked at least 24 hours in advance, through the Archaeological Survey of India's offices in Agra.